Let’s get one potentially controversial point out of the way first: this is a £20 bottle of beer. If that shocks you, you’ve not been paying attention to what’s happening in the market: there are more expensive beers than that. Some of Thornbridge’s sour creations sell at £15 for a bottle half the size. And £20 is barely leaving the foothills in the Land of Wine: even my local corner offie, which will sell you 24 cans of Foster’s for £20, has half a dozen wines for sale at that much a bottle or more. This is also a very rare bottle of beer: Goose Island has brewed not much more than a couple of thousand litres, around 3,600 (UK) pints, of Brewery Yard Stock Pale Ale, and only 600 bottles have made it to the UK, where they are on sale in fewer than a dozen London outlets, including The Rake by Borough Market (where it was launched last Thursday), Mother Kelly’s, We Bought Beer, the White Horse in Parson’s Green and Clapton Craft. So: is it worth it? Certainly the bar has been raised once again in the “authentic old beer reproduction” high jump, after Carlsberg’s effort earlier this year in brewing an 1883 lager with revived 1883 yeast. And BYSPA is a considerably more complex drink than Carlsberg’s straightforward 19th century sipper. The back-story first: Mike Siegel, Goose Island’s “brewing innovation manager”, decided early in 2014 that he wanted to reproduce an old British ale of some sort, one that involved ageing in oak barrels and finishing with Brettanomyces. A great many people make the sign of the cross when Goose Island is named, believing that, since it is now owned by AB InBev, all its works bear the Mark of the Beast. But for me, any company that lets one of its managers say: “Hey – I’m going to spare little expense in recreating an obscure beer from 140 years ago” cannot possibly be totally bad. 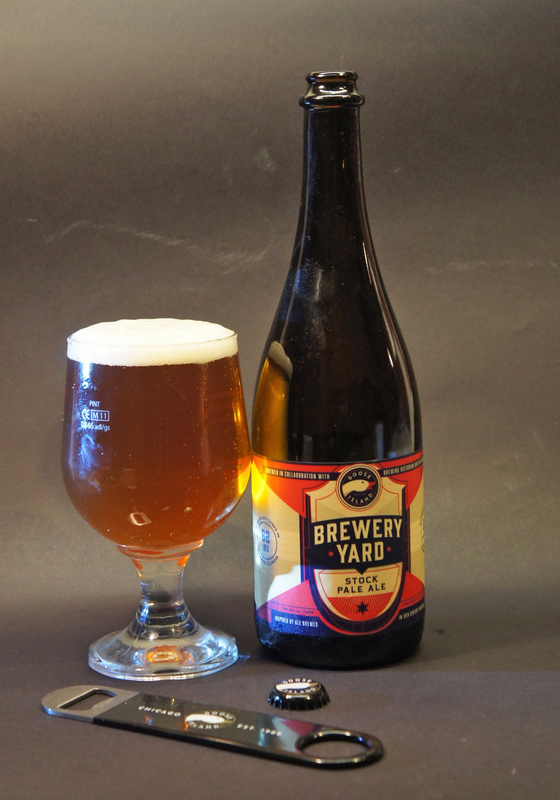 The beer Ron and Goose Eye have made is called Brewery Yard in recognition of the fact that Bass and its fellows would leave their stock pale ales outside in the yard for a year to mature, while the Brettanomyces that lived in the wood in every vat and cask in every British brewery munched away at the higher sugars that ordinary brewing yeast, Saccharomyces cerevisiae, had left behind. (This is itself a not uncontroversial call: some, notably Steve Wellington of the White Shield brewery, insist only Burton Ale, the sweeter, fruitier beer Burton brewers made before India Pale Ale, was matured in the yards. However, Ron has pulled out enough evidence to convince me the stock pale ales went through this out-of-doors maturing.) Chicago’s climate being rather less temperate than Burton’s, they couldn’t leave Brewery Yard outside (unless they wanted to make ice-beer), so it was stored inside, and the Brett was added deliberately: B Claussenii, the variety Niels Hjelte Claussen found in a sample of English stock ale at the Carlsberg laboratories in Copenhagen in 1903 and identified as the yeast that gave stock ales and stouts brewed by British brewers their inimitable flavour. Over the 11 months and two weeks the beer sat in its casks, fascinating changed were occurring: the alcohol level climbed 15 per cent, to 8.4 per cent abv, while the bitterness plunged by more than a third, to 62 BUs, and the Brett added its own flavours and aromas as it multiplied in the dark. What is the beer like, 15 months on from when it was brewed? Lovely. This is a big beer, that, like a powerful red wine, I’d recommend opening and then leaving for a while, to let the flavours be drawn out: pour a glass, take a sip, and then leave it for 15 or 20 minutes before you return. The taste and the aroma will cover your tongue and fill your nose: the sourness is perfectly balanced, the bitterness not at all obtrusive, the Goldings contribute tangerine and mandarin, the Brett sweaty leather and earthiness, old dogs and tobacco, there’s raspberries and lemons and a touch of pepper. It begs to be accompanied by food: thick-cut steaks well-charred on the outside and still bleeding in the middle, heavy-gravy stews with garlic dumplings, roast venison and game chips … drink this, and you’ll want to pick up a Union Jack and start singing Rule Britannia. At Thursday’s launch strong cheeses were offered as accompaniments, and Brewery Yard will certainly hold its corner against the maturest Cheddar or bluest Stilton. Overall verdict, then, hurrah for Ron and Goose Island, it’s marvellous to have a chance to try this beer, and it’s a terrific brew even ignoring the history. You won’t be wasting your £20. 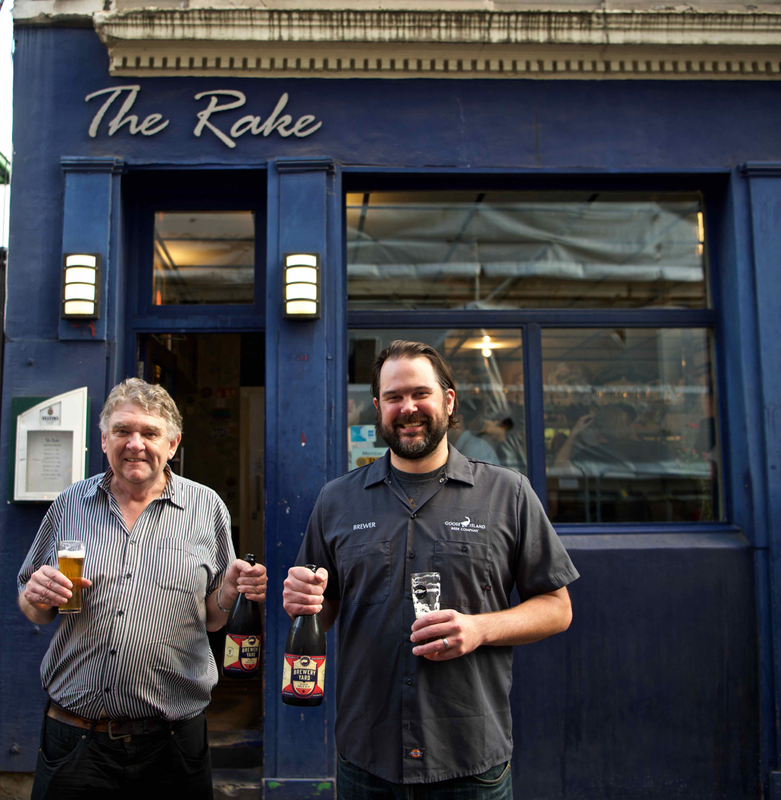 Mike Siegel says he wants to produce more old British beer styles, and I greatly want to try them. Yes, as Ed Wray said on Twitter, this is in large part a marketing exercise by Goose Island and AB InBev, who hope the halo effect from Brewery Yard will cast a happier glow over their other efforts. But if all their marketing efforts were as yummy as this one, I’d not have a problem. • Addendum: a number of commentators have compared BYSPA to Orval. To the extent that they are both pale ales brewed with EKG and with Brettanomyces used for a secondary fermentation, there are similarities, though Orval uses a different strain of Brett (bruxellensis) and the Goldings are a dry-hop addition, not in the main boil. But side by side, they are clearly different beers, though related: Orval is darker and redder, more highly conditioned, while the BYSPA is fuller in the mouth, slightly oaky in a way the Orval definitely is not, sharper and more citric than the Orval, and the Brett character is much more forward, while in the Orval I drank it was definitely there, but more muted, more part of the choir than the featured singer. Any relation to Orval is a friend of mine. I look forward to scouring the beer shops of Kansas City to find a bottle, if there are any over here. Brewery Yard Stock Pale Ale sounds great, but I am affraid it is not available in Czech republic. We have brewed Porter inspired by Irish Porter 1850-1870 (Pilsner Malt+Carafa III, only EKG). 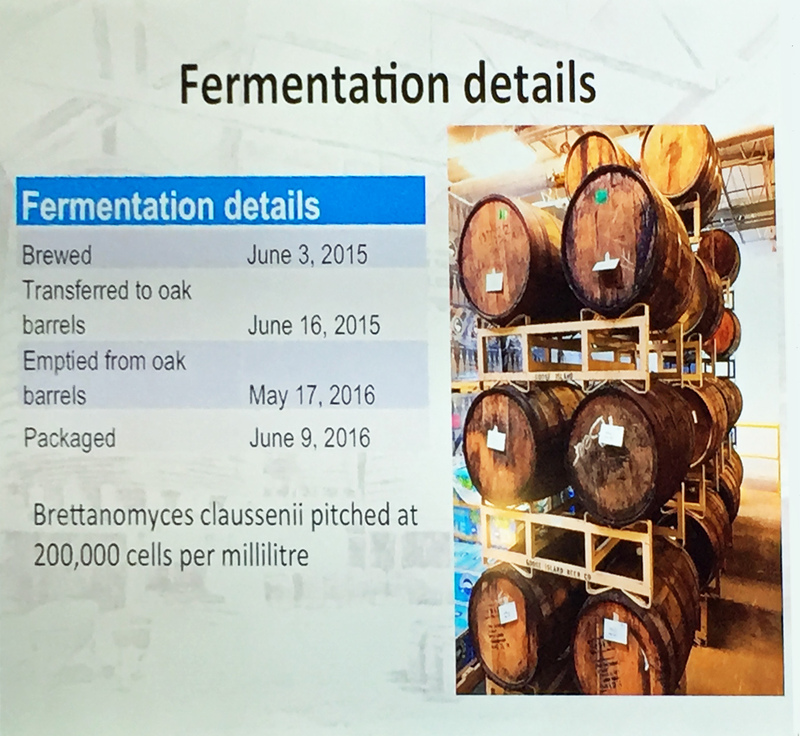 And part of the batch in Kegs was infected by Brettanomyces Clausenii (3 different volumes), but unfortunately whole batch of beer was also infected by undesirable yeats/bacteria and became rotten. What do you think about using Pilsner Malt instead of Pale Malt? I have read contemporary PM is closer to historical PM than contemporary PM (higher in colour). According to book Měšťanský pivovar v Plzni 1842-1892 (Burgher’s brewery in Pilsen 1842-1892), they built malt-house in english style. And Czech Pale Malt (Pilsner Malt) is still made almost the same way today. Especially if we talk about colour. I also plan to brew real Grodziskie (100% Oak Smoked Wheat Malt, polish Hops and Yeasts etc. :o).